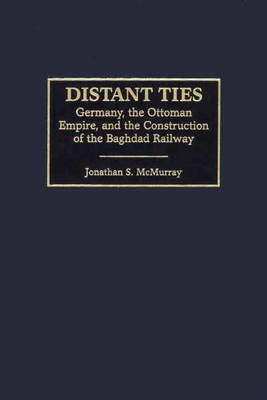 As the first study to document the Baghdad Railway construction, rather than the rhetoric surrounding it, this work challenges nearly a century of scholarship on German imperialism and Ottoman decline--scholarship that has too often hinged on the alleged Great Power victimization of the Ottoman Empire. McMurray unearths a fascinating, intercultural dimension of the railway and provides a comprehensive, detailed account of the Ottoman contribution. His work denies the German character of the railway by showing it to be an exclusively Ottoman enterprise designed by German engineers, funded by international capital, and built by a veritable army of Ottoman subjects. The study refutes the notion that German involvement in the Baghdad Railway somehow represented an orchestrated plunder of the Ottoman Empire. It reveals instead, the benefits this union bestowed on the Ottomans despite growing discord between Germany's leading political, financial, and cultural advocates of the railway. It traces back to the genesis of German interest in the enterprise before the Age of Empire, and it shows that the initial impetus came from private individuals whose commitment to improve the empire's infrastructure lay anchored in the hope that the Ottoman Empire would one day become Germany's ally. Finally, it reveals that German involvement with the railway did not traumatize the Ottoman Empire, but rather offered it a new lease on life, helping to strengthen the Ottomans' resolve to counter further European incursion.